Tomorrow is August 17th, 2009, which means that today, August 16th, 2009, is almost done and gone forever and ever and ever. Never to be recaptured. Gone, like a puff of smoke in the breeze…. I think that maybe I’m feeling a little melancholy because my rug monkeys are back to school tomorrow, going into grades 4 and 6. Summer just dried up and blew away before I even had a chance to take it in. Yeah, it’s still hot out, bug season is still in full swing, and people are still grilling in their backyards. But the beginning of the school year is a huge red star on the calendar that tells me that the boys of summer are almost gone, and it’s time to get back on some sort of a schedule, stock up on pencils, and make sure the kids aren’t “secretly” reading the book they can’t put down with a flashlight under the covers, after the call for lights out. I know there is good stuff coming up to look forward to, like holidays and family gatherings, school plays and recitals, puberty and boys….ok, not so much the last two, but you know what I’m saying. Still, I think that I will finish this post, put away the dishes in the dishwasher, get lunches ready for the morning, and then sit out on the back patio and take in the summer night sky just one more time. The bugs can keep me company. Yesterday I found myself with a loaf of focaccia I hadn’t even opened yet, a slab of top round roast, and some carrots that really needed to get used up before they sprouted or mummified, whichever came first. I thought maybe a sandwich, my favorite summer meal. But what to do with the carrots? 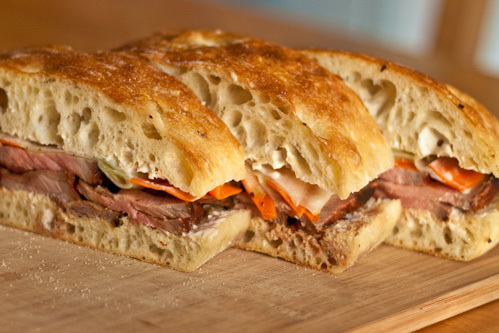 This is the sandwich I came up with, very loosely inspired by that Vietnamese sandwich that seems to be all the rage these days. 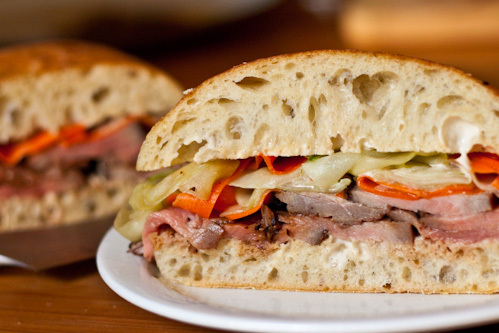 A soy marinated, grilled, and thinly sliced top round roast, served on a loaf of focaccia slathered with a ginger-wasabi mayo and topped with shaved carrots and cucumbers that were briefly pickled in sweetened rice vinegar. Turned out pretty darn good, thankyouverymuch. 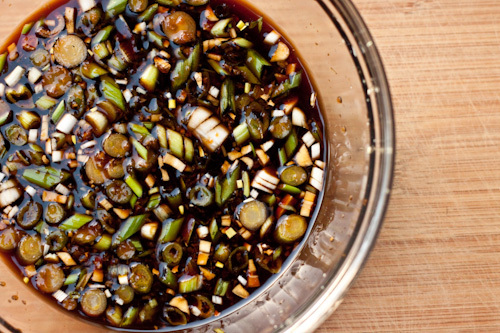 Combine the soy sauce, rice vinegar, scallions, garlic, ginger, honey, and sesame oil in a bowl. Place the top round in a plastic freezer bag and pour the marinade over the top. Seal the bag, squeezing out as much air as possible.Marinate in the refrigerator overnight. 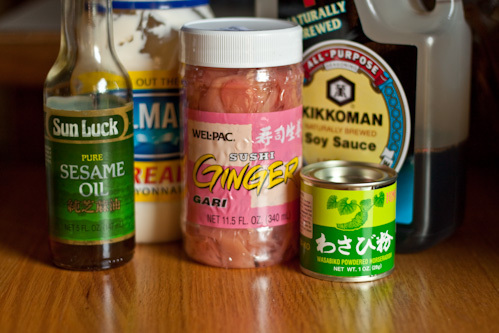 Prepare the wasabi mayo at this time as well. Preheat the grill to medium, and cook the beef turning once, for 7-10 minutes per side, or until the internal temperature reaches 135°F. Set aside to cool. While the steak is cooling, prepare the pickled carrots and cucumber according to the recipe below. When the beef has cooled and the pickled vegetables are ready, slice the beef as thinly as possible. Slice the loaf of bread in half, lengthwise. Spread about a tablespoon of the mayo on each cut side of the bread. Layer the beef on the bottom slice and top with a generous amount of the pickled veggies. Cover with the top slice and cut into individual servings. 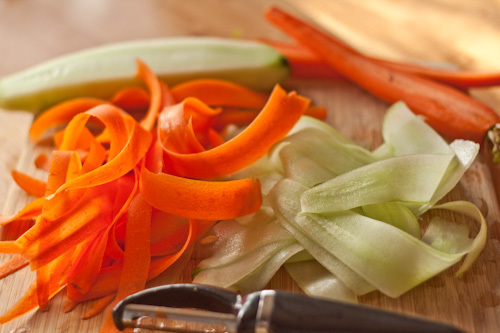 Using a potato peeler, shave thin slices of the carrots and cucumbers. Add the remaining ingredients to a medium bowl and whisk to combine. Add the carrots and cucumbers, and stir to coat with the vinegar mixture. Let sit for 20 minutes, stirring a few times to redistribute the vinegar mixture. The veggies will be tender, but still have a bit of crunch when they are ready. 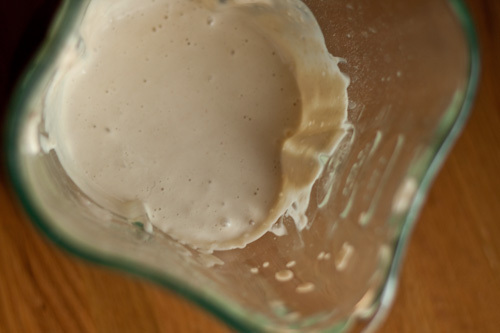 Combine all ingredients in a blender and puree until smooth. Refrigerate overnight before using. My goodness, those sandwiches look and sound delicious. Great pictures. Will have to try these soon. Had to laugh about calling your boys monkeys, I have three Yorkshire Terriers and we call them monkeys. I don’t miss Kansas bug season…..those awful June bugs. That’s what we called them, those red round beetles with sticky feet. I do miss the cicadas singing tho. Those sandwiches look gorgeous and I’ll bet the wasabi mayo gave it a real kick 🙂 I’ll have to try this for my next sandwich – thanks for sharing! Lea Ann: Lol! You miss the cicadas, and when I first moved here, I could barely get to sleep at night because of them 🙂 We didn’t have cicadas back home. They were a very loud surprise to me! Danielle and Jessie: The mayo had kick, but wasn’t killer spicy, so if you want a bigger kick, just add more wasabi powder. And making it the day before makes a huge difference in the flavor. It really does need to sit and blend for a bit. It would probably mature faster if you used the wasabi paste instead of the powder. Love the spicy mayo. That would be great on its own even. Great recipe! I love this asian inspired recipe. Looks really yummy. Good combination of east and west. Great job. Your photos are beautiful and that sandwich has all the flavors I adore. I started tearing up while reading your post. I am also feeling rather sentimental about my kids returning to school and wish I could freeze this summer in time. This looks amazing! Can’t wait to try it. Thanks for sharing! The Duo Dishes: I used the leftover mayo on just about everything for the next week. So yup, it’s great on its own too! Jessica: You are very welcome. I hope you enjoy it. You are my first comment on Foodbuzz. Great post. Love it. Now need to go check out your blog! Looks like a perfect Saturday lunch. Brilliant idea, I’m loving this! Please tell me any online tourist plans available in the internet? The internet is with a doubt growing into the most important medium of communication across the globe and its due to sites like this that ideas are spreading so quickly. Admiring the time and effort you put into your blog and detailed information you offer! Thanks again, really is interesting for those searching for innovative dishes. Many thanks for enlightening me! This is great post, and I’m glad to see you sharing it with your readers. This sandwich sounds like something I would eat in a restaurant. Boy I want a bite.